Mrs. Alice Eva Schmidt Johnson was born on August 10, 1923 in Beiseker, Alberta, Canada. She passed away on February 6, 2019 at the age of 95 in Boise, Idaho. Raised on the prairies of Alberta, Alice completed all local schooling by the age of twelve. Wanting to further her education she began attending Calgary Technical school where she studied tailoring. After nearly completing the program with excellence, she was sent home when it was discovered that she was not old enough to attend. Shortly thereafter the Schmidts moved to the city where her life changed dramatically when the family began attending Calgary First Church of the Nazarene. Answering God’s call on her life she left for high school at the age of 19, attending Canadian Nazarene College in Red Deer, Alberta. After matriculating with honors, Alice informed her reluctant parents that she would continue her education by going to Northwest Nazarene College in Nampa, Idaho. She would become NNC’s homecoming Queen in 1947. It was in college that she met Jerald Johnson, the young man who brought such joy and levity to her serious nature. The two were married in 1948 and have enjoyed over 70 years of marriage and ministry together. 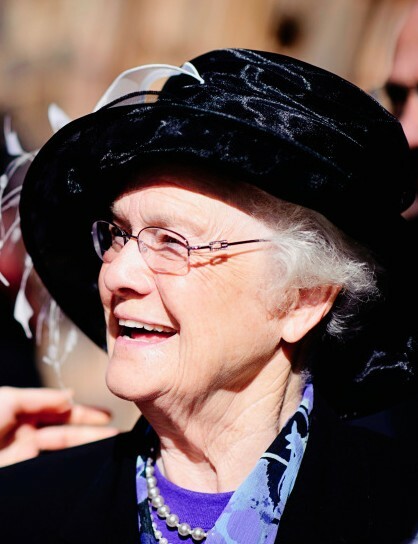 Throughout the years Alice has been a companion and partner in the ministry of her husband, Jerald Johnson. While pastoring in Coeur d'Alene, Idaho their two eldest sons, Jerry and Dennis were added to the family. The Johnsons pastored on four Nazarene districts in the United States, including Nampa College Church of the Nazarene, and Valley Shepherd Church of the Nazarene in Meridian, Idaho. They also pioneered the work of the Church of the Nazarene in West Germany, where Dr. Johnson was the first district superintendent of the Middle European District. While in Germany, the Johnsons were instrumental in the founding of European Nazarene Bible College, and Alice, with her degree in Christian Education was one of the first professors. Germany had a profound impact on the entire family, but especially Alice. Having been born in a German-speaking community of Russian-Germans in Canada, Alice was fluent in the language and culture. Two children would be born in Germany: Kurt and Carla. Ever sensitive to the needs of others, Alice would welcome many people into the home, showing great hospitality and serving many a hot meal. As a result, she had numerous German spiritual children; those who came to faith because of her ministry. The family returned to the United States where eventually Dr. Jerald Johnson would serve as the Director of Nazarene World Missions. Later, in 1980, he would be elected as a General Superintendent, a position that he would hold until his 1997 retirement. In retirement, the couple still pastored five more churches, including one in Germany. In every position held by Dr. Johnson, Alice matched him, stride for stride; they were, indeed, “a team”! Alice was preceded in death by her parents, Jacob and Anna Schmidt, her sister, Beatrice, along with her brothers, Albert, Calvin, and Harold, as well as her oldest son, Jerry, Jr. Alice is survived by her husband of 70 years, Dr. Jerald D. Johnson of Meridian, Idaho; her sisters Hannah Notland and Bernice Wolstenholm Clark; her children, Dennis Johnson (Kathy) of Eagle, Idaho; Kurt Johnson (Melissa) of Hamilton, Ohio; Carla Sunberg (Chuck) of Shawnee, Kansas; along with her dearly loved grandchildren: Melanie Pollack (Jeff), Misty Johnson (Jonathan), Robby Johnson, Matthew Johnson, Sarah Johnson, Carmen Johnson, Alex Johnson (Ashleigh), Christa Maciver (Iain), Hilary Swideki (Paul), Cara Shonamon (Justin); her eleven great-grandchildren, and the two who will soon be arriving for whom she prayed daily.